Buddha charms can be placed in your home, car, purse, clothing, keyrings and as jewelry to invite auspicious energies into your life. Many Buddhist charms can be used more than one way. Look for charms like the ones suggested below -- similar options that fit your home and lifestyle work just as well. 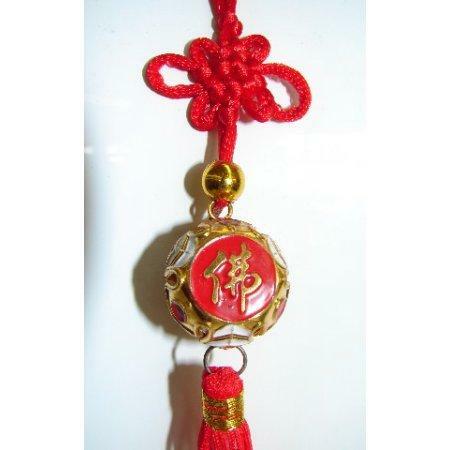 There are specific ways you can take advantage of Buddha charms to boost and enhance various feng shui luck sectors. Wall hangings and other charms can address any afflicted areas in your home or be used to attract general abundance into your life. This unique Buddha wall hanging is handmade with no two alike. Onyx, aquamarine, cinnabar, coral and turquoise beads may be chosen in any combination to construct the hangings. The Buddha figurine is made from pure brass. Place on southeast wall for wealth luck. Hang on east sector wall for health luck. Set on north wall in your office for career luck. It's 7.5" in diameter and costs around $24 plus free shipping. 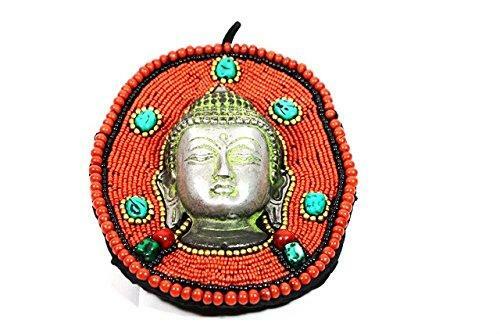 A multi-amulet Buddha charm can be used in your home as well as your vehicle. 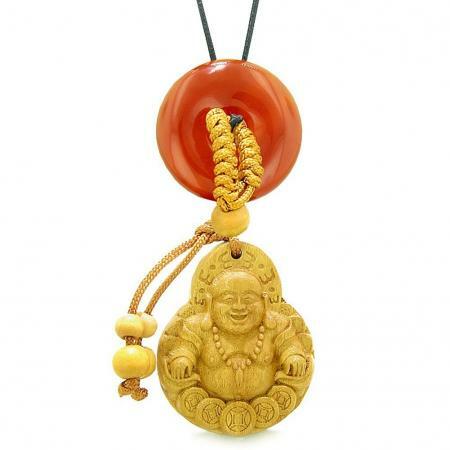 This charm consists of a wooden Happy Buddha figurine and lucky coin donut. The charm comes with an adjustable stretch cord. A metal keychain is included in case you wish to use as a car feng shui charm. Place in afflicted sector to invite good luck as well as protection. It's under 2" and is priced around $15 plus shipping. This Cloisonnes Buddha Charm features the Chinese character Fo, which is the Chinese word for Buddha, and a tassel trim. The description states that it has a beautiful sound when shaken. Use the Mystic Knot hanger to place in your home. Place the symbol in the southeast (wealth) sector or corner of your home or office. Use in a lobby or at cashier station to attract greater wealth into your business. You can set this charm in the center of your home to bestow great wealth on your entire family. It's about 9" long and costs about $8, plus shipping. The crystal of this charm features a Buddha image with children is suspended from a mystic knot ad features a tassel bottom trim. This Buddha depiction is believed to attract children to those wishing to conceive. Place in the Descendants Luck sector (west) of your home or bedroom to receive the Buddha's blessing to conceive. Use this charm in the west corner of a child's bedroom to ensure her/his well-being and abundance. Hang this charm in the Health Luck sector (East) of home or east corner of the dining room where your family receives nourishment for health. You can set this Buddha in almost any sector to attract its governing luck. It hangs about 10" long and is priced around $7 plus shipping. You may wish to carry a Buddha charm with you, such as a keyring, that's attached to a purse/backpack or worn as a pendant or bracelet charm. Keeping the charm with you is believed to provide protection against inauspicious energies, such as car accidents and illnesses. 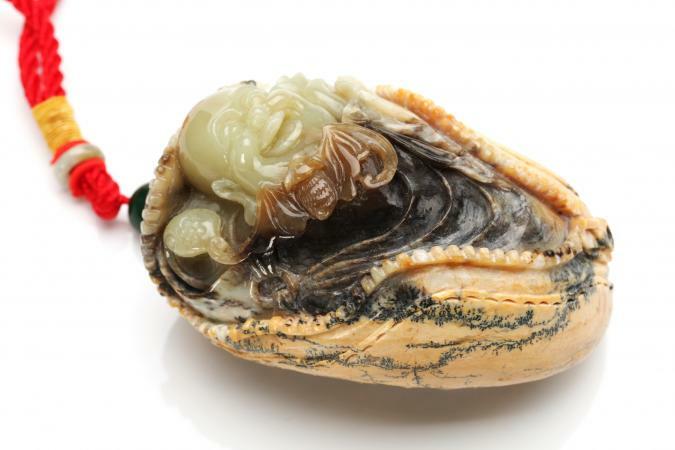 It can also attract auspicious luck, such as wealth, career, and overall abundance luck. 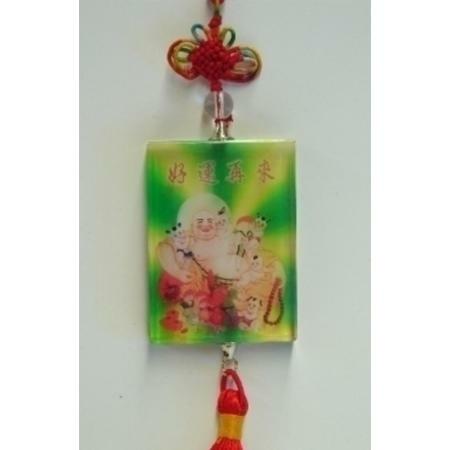 This keychain features a Wu Lu and Medicine Buddha and is said to protect the owner's health. The Medicine Buddha is representative of the period when Buddha attained Enlightenment and made 12 vows that included healing illnesses or injuries. Buddhists ask Buddha for healings that come as spiritual medicine that manifests in physical, mental and spiritual healings. The charm depicts The Buddha with a halo of healing energy emitting about his head. Medicine is often portrayed with the color blue. 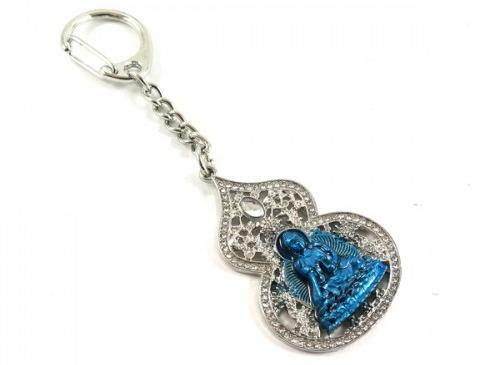 This charm features a blue colored Buddha. The Wu Lou is a popular feng shui health protection symbol. The two combined symbols offer double the protection. Ensure the healing powers of The Buddha by keeping this charm with you as a keyring or attached to a purse or backpack. You can disconnect the keychain and use the charm to counter the annual #2 Illness Star by placing it in this sector in your home or office. It's about 1" x 4" big. Expect to pay around $20 plus shipping. This keyring features a peach wood carved Money Buddha. 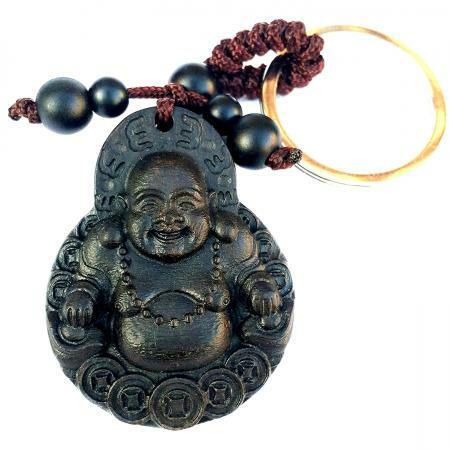 This charm features a Laughing Buddha encircled by money. Using this as a keyring, you are ensured to attract money into your life. Attach this charm to your purse or backpack for wealth luck. The plaque is just under 2" x 4". It costs around $10 with free shipping when you have Prime membership. The Laughing Buddha with Ruyi on White Jade hangs from a mystic knot with a red tassel attached to the bottom of the amulet. Jade is a symbol that brings serenity and strength to the one who possesses it and protects against inauspicious energy. The tassel features a gold cap that allows it to swivel and push the negative chi away. The Ru Yi is a symbol of power and the ingot is a wealth symbol The supporting mystic knot ensures that all the luck each symbol brings is never ending. Hang this charm from your rearview car mirror for travel, wealth, and personal protection. Size: 1.75" x 2.5" x 0.625", 14" L.
Price: about $20 plus shipping (depends on weight and method selected). 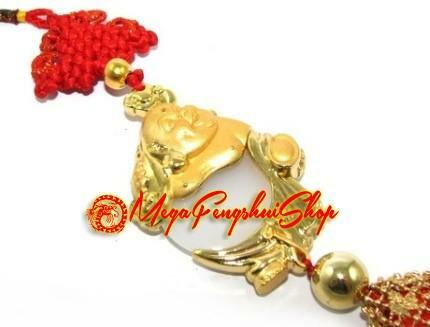 Buddha charms offer protection and will enhance luck sectors. Most can be used in your home, office, or as a portable charm. If you don't want to purchase the ones listed above, look for those will similar features that suit your personality and invite luck into your life.